A souvenir from Turkey. Meerschaum. Turkey, specifically the Eskisehir area, is the world's leading producer of meerschaum. 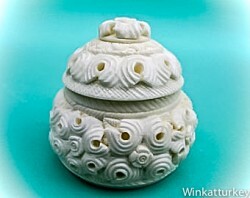 It is a white mineral which is also known as sea foam and pipes very appreciated by smokers are manufactured with it. In all Turkish bazaars we find shops to buy souvenirs made with this mineral, recently, all kinds of meerschaum have become very popular. Brooches, Bracelets, necklaces and rings attract attention of the tourists who visit the country and choose this memory because it is a characteristic purchase in Turkey. 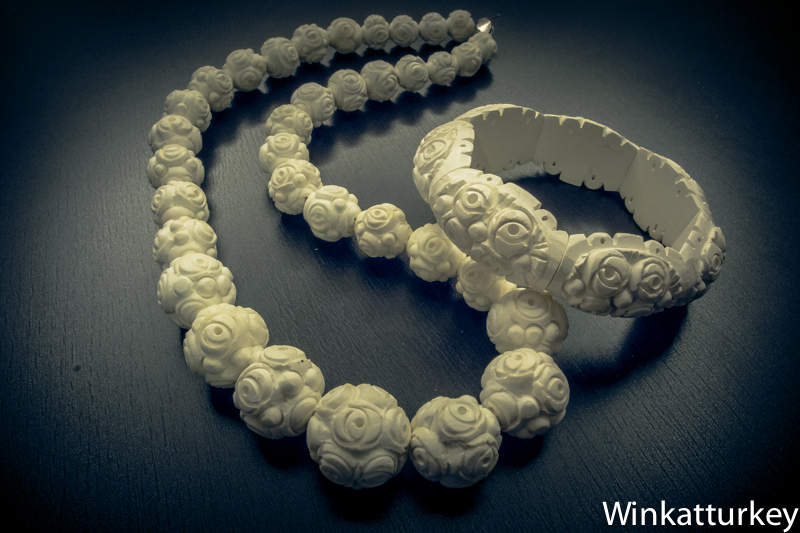 The white mineral which these beautiful pieces of craftsmanship are made of is called sepiolite, it is very soft and easy to work. When the craftsmen finish the pieces they usually cover them with a wax to protect them.. Traditionally, Meerschaum is used to make pipes with a great tradition among smokers. Using, pipes make them to become darker and take a caramel color. Rings, Bracelets, Necklaces, etc., are found in all prices and are lightweight and striking accessories that will always remember our stay in Turkey because they are difficult to find elsewhere. Due to the imagination of the artisans and the possibilities of meerschaum today we find all sorts of items made from this material. If we visit a bazaar and found a shop where they are sold, it is worth looking into. Accessories, jewelry boxes, chess games, figures of all kinds and of course the famous pipes are very attractive and we always will find something within our budget. Most of the pieces are white but we will also find articles that have been given some color, preferably toasted tones but there are also some of them in black. Normally, meerschaum articles are made from a mineral stone that the craftsman will work, however, other pieces that are made with pressed meerschaum powder and compacted with resin are also sold. Logically they are much cheaper because they can be mass-produced. Besides the price, we can distinguish between them because they are quite heavier than the natural ones. 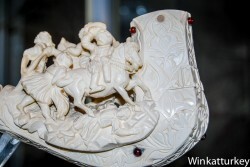 If you are particularly interested in meerschaum articles , the best is visit Eskisehir. The largest deposits of meerschaum are in the University City by excellence of Turkey and therefore there is a great artisan tradition there. This is a highly recommended visit where we can enjoy their huge and well preserved parks, gondola rides along Porsuk river , know the Odunpazari Ottoman quarter with its colorful houses and of course, visit Atlihan bazaar where we will find a veritable universe of meerschaum stores . Eskisehir is also known for its young atmosphere and nightlife. Meerschaum krafts are one of the characteristics of Turkey. Necklaces, Bracelets, Figures and course, the famous pipes, They are among the tourists most desired souvenirs in bazaars.